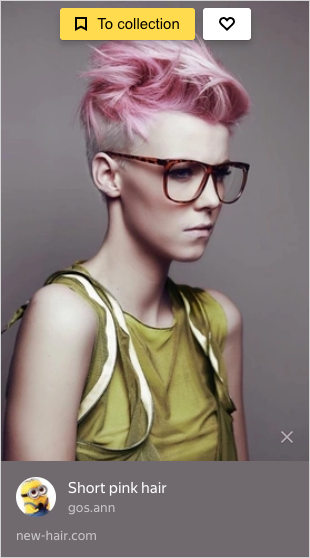 If you want to get a haircut, you will most likely be sorting through options, looking for the most suitable hairstyle. Yandex.Collections has many options available that are collected by other users. You can browse these options, looking for suitable ones among them and add them to your own collection in order to find the best of the lot. To get started, type in a subject, idea or keyword into the search field. If there have already been collections created on your topic in Yandex.Collections, they will appear in the search suggestions. 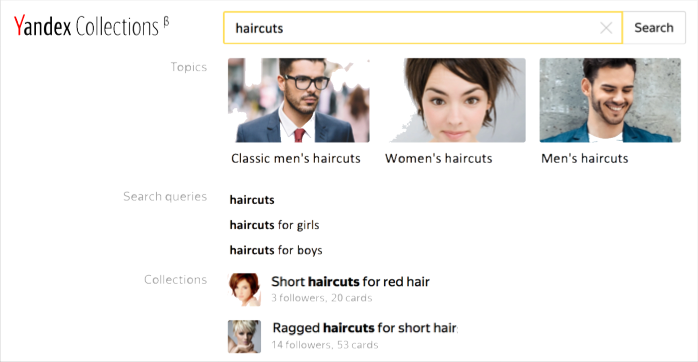 The search results page will display options on your topic in the form of cards. If you see one you like, you can immediately save it to your collection or go to the collection page for that card to see more relevant options.